white legs. Month later, added Coral Banded Shrimp who happens to be extremely territorial now. Got rid of damsels, added a mandarin goby and tried the addition of clowns. That failed miserably as they had a parasite and didn't figure it out until it was too late. So, gave up on fish, decided on route of don't buy it until the tank needs it. Finally had the outburst of wonderful algae, so we thought. Added two ? snails and two margarita snails. Decided we needed something more to eat algae as it was starting to take over. Bringing us to the lawnmower blenny. He was wonderful! He just ate and ate and ate! Almost as if he didn't know when to stop. Quite literally actually. We then needed something more we thought. Purchased Orange spot snail..fun to watch. Also Firetail Blenny. That was an amusing introduction. The lawnmower at this point was huge. A living teeter totter. I thought he was going to burst. That is the only thing we can think of as the reason behind his death. The firetail also seems to have picked up on the over-eating issue as his belly is slowly growing. maybe the last one had an eating disorder. Purchased one more lawnmower. About a week ago I noticed a Bristleworm! Yikes I thought as we have not introduced any new rock since the first of the tank. Naturally occurred? 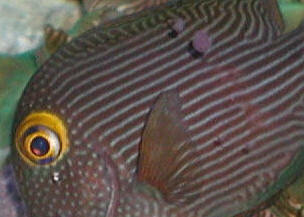 Did some research and we decided on a six lined wrasse. Tonight is his first night with us. So, now we have 10 asstd sizes and types of hermit crabs, 2 emerald crabs, 5 basic snails, 1 orange spot snail, 1 lawnmower blenny, 1 mandarin goby, 1 firetail blenny, all of the above mentioned shrimp, and tonight's wrasse. We noticed that this lawnmower is starting to get fat. Just his belly. I have to say I think we spoil or shrimp and crabs as they are fed frozen Mysis shrimp, frozen krill, and the pellets of course. Just a small buffet. Have never seen the lawnmower partake in this diet though. Is he ever going to stop eating!? I would hate for his belly to explode too! He is not going to run out of food as some parts of the tank are down right furry! I have also noticed 3 different worms in the substrate other than the bristle. That will be for me another day. Is our tank just overrun with life or what!?! We keep finding weird little creatures that we didn't put there..on purpose anyway. We often wonder why we have cable, I think we watch the tank more! Main Q, how to save the blenny from eating himself to death. Do things occur in the tank naturally or just forever to develop? Kole Tang with Fin trouble 7/9/07 Hi I know you have heard this before, but you have a superb site, and normally I find everything (and more) through the search. In this case, I have not found a matching set of symptoms, so I hope you will let me "pick your brains" instead. <Not much left...> I have a 2-year old soft coral reef setup in a 72Gal Bowfront, with 15 gal sump. The inhabitants are a 6" Foxface, a 4" Salarias fasciatus (a.k.a. lawnmower blenny), and a 2.5" Kole. All have been in the tank for the full two years. Other notable inhabitants include a Lysmata amboinensis ("skunk" cleaner shrimp), and a "banded" serpent star (Ophiolepis superba). In the last day or so I notice that the Kole is favoring one pectoral fin, which is cloudy and while not shredded, seem a bit eaten away at the very end. <I see this... and some other damage on the flank> There are also two abrasions on its body, posterior to where the fin would contact, but directly in line with the fin if it were full-back. On the picture I attached, all of these areas seem somewhat pink, but in "real life" both the fin cloudiness and abrasions have a more "white" color. There is no redness, black spots or growths, (e.g. the symptoms I see associated with "fin rot" in the other posts.) (note there are two spots of coralline above the abrasions, I don't want to confuse you with those). <Thank you for this clarification> The fish is eating normally, but seems a bit spooky; every now and then it darts away for no apparent reason, (it is normally a very confident. It is "schooling" with the other two fish like it normally would, and mixing it up with them for Nori (rubberbanded to a rock) even though I put in multiple rocks this morning to try to give it some quality munching time on its own. But it is obviously having trouble swimming, (it reminds me of riding a bike with just one pedal). I have two 660 gph powerheads in the tank (Turbelle 6025s) and this morning I turned one off to make it easier for a one-finned fish to get around; that seems to have encouraged it to resume a normal (i.e. incessant) browsing routine. It also chased after some flake food I put in. The tank is fed daily with half a cube of either formula 1 or 2, soaked in Selcon, aside from the Nori-rocks. If this is an injury I think it could only come from the banded serpent, or the blenny, but it does not match the blenny's usual "hey that's my food" circular mark (which the other two fish have worn at times, but have never been injured by). <I do suspect the Blenny... Resource partitioning here... Atrosalarias are VERY defensive re their turf/algae... and the Kole is perceived as an intruder...> Anyway if the Blenny were getting to be a bully, I don't think I would see the Kole near him, and yet they are swimming together as much as normal. <Mmm, a bit of "schizophrenic" behavior here likely> The banded serpent does get fed (I target feed sinking pellets), since I don't completely trust him. The other possibility to explain the scraping is that with the fin compromised due to some fungus or bacteria, the Kole could not navigate properly and crashed into a rock, particularly with these high flow powerheads going. <This is also quite likely... from provocation from the two prime suspects likely> So the question (sorry to be so long winded!!!) Do you think this is a fish or critter-induced injury, or an infection of some kind, and do I need to get the Kole out to a treatment tank? <I most suspect the Atro/Salarias... but in either/all cases, I would move the Ctenochaetus elsewhere... and likely hold off on actual "pathogenic" treatment... It should self-cure under better social circumstances> I do have a 20gal QT, which is currently inhabited by a small Rainford's goby, who is a week into Quarantine. I am afraid the Kole would not like the confines of a 20 gal too much, since it is not acting "sick". But if there is some possibility of spreading this to another fish, I will move it, and cross my fingers. If it needs treatment, what would I treat with? <Would be better isolated... even in a sump/refugium... no chemical treatment> Oh yes, readings are: Temp 78.2, Daytime PH 8.3, Salinity 1.027, Ammonia 0, Nitrite 0, Nitrate 4 mg/l, Ca 320, <A bit low> dKH 7. -Starving Blenny- I sent this yesterday to crew@mail.wetwebmedia.com I haven't heard back so I'm sending it to this address hoping for assistance. <Unfortunately we're a little short staffed because of Interzoo, please only send once.> Thanks Dear Bob or whoever is helpful today- <Kevin here, hope to be helpful!> Mystery fish update: The mystery fish is growing quickly! It is over an inch now & is starting to get some color (black, white & red on the dorsal fin, red on the head & red on the caudal ventral fin) It is fun watching this little one grow & trying to figure out what it is. <Sounds cool!> New question. I haven't been able to find a definitive answer so here is goes. Setup (running 6 mths): 55 gal, 90# CLR, 5" DSB, 5 gal refugium (macroalgae, bugs & 3 lettuce Nudibranchs), 1 gal refugium (with Aiptasia), protein skimmer, 2 percula clowns (probably false), 1 cleaner wrasse <yikes, in the future please don't support the continued import of these critters since most don't survive for very long in captivity.>, 3 green Chromis, 1 Jeweled Blenny, 1 emerald crab, 2 peppermint shrimp, 2 cleaner shrimp, 3 sand sifting stars, 1 brittle star, 1 Halloween crab, asst snails & hermits, 1 rock anemone, 1 Condylactis, 1 leather soft coral & 2 clumps of Xenias. When I purchased my Blenny from the LFS he was fat, now he is very skinny. 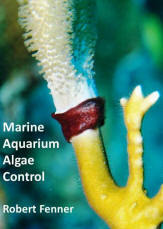 I asked the LFS what to feed him & they suggested "Seaweed Selects Brown Marine Algae" (dried). I purchased a little clip to hang it on the tank. The big turbo snails go bonkers for the stuff, but Blenny doesn't touch it. <If it's the same algae eating blenny I'm thinking of, they require almost constant feeding to keep up their weight.> I've also attached different types of macroalgae to the tank with the same results. I've been trying this for about 10 days now & there is no interest in Blenny's part. I'm very concerned that my fish is going to starve to death. Do you have ANY suggestions of what I can entice it with to eat. <These critters are more of green algae eaters, so I would select the dried seaweed appropriately. If the fish is really that skinny, it may be wise to move it to your refugium in hopes that he will take a liking to some of the greenery in there. If you choose to leave it in the main tank, I would move seaweed eating snails out so the blenny can feast without bother. This fish should also eat from the water column with the other fish in the tank, and if it does, do your best to stuff it full of whatever you can get it to eat. You may want to try breaking up the dried seaweed and feed it like flake food.> It is certainly hungry because it kisses the glass & rocks all day long looking for scraps of algae. <See if your LFS has a rock covered in hair algae or the like, I'm sure the blenny would be very pleased.> I'm driving to "the big city" this afternoon where there are larger LFS's & may provide a larger variety of food items for Blenny. Please send me some direction before my fish dies. Sincerely - Jennifer BTW, I did hang some rinsed lettuce in the tank last night & no one touched it. <Avoid the terrestrial foods in favor of dried seaweeds, they're much better for them and natural to boot. 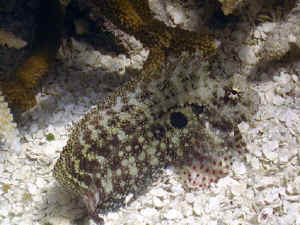 I hope this helps, -Kevin> Blenny had gone to bed already so maybe she will be more excited about it today. Lawnmower??? I know that the Lawnmower Blenny eats algae but is it a "sand sifter"? Also would the Neon gobies from FFExpress be a good cleaner species. Its says that if they are captive bred that they may not clean. Would those? Thanks, Tim >> Lawnmower Blennies (mainly Salarias fasciatus) are not much in the way of Sand Sifters.... they spend most all their time in/on the rocks... and Neon Gobies, tank raised or no will generally learn to be cleaners... if there are customers to be had. Bob Fenner, whose Sand Sifter, Blenny, and Goby articles and more can be found, perused at www.wetwebmedia.com, including images. Re: 2 Lawnmower Blennies in same tank. No LR in the 29G. Some algae growth. I realize all individuals are different but I'm trying to make an informed choice here. If I put him in the 120G there will be no chance of retrieving him. Do, in general - in your experience, lawnmower get along or fight? <They almost always fight... unless there is sufficient space, food, hiding/visual get-away places... If there is not a real need for another, tolerance of angst on your part, I'd trade the one in. Bob Fenner> Thank you.